ulsheimer : canoes and whaling, west africa, 1600. Andreas Joshua Ulsheimer : Canoes and Whaling, West Africa, 1600.
held by Wilhelm Schneider, Tlibingen,1983. Ulsheimer records his ship being approached by sixty canoes, apparently intending to attack. Upon firing canon at close range, the natives initial response was to dive underwater, then retreat in their canoes. The following day, two canoes appeared with caution, one natve "repeatedly dipping a finger in the water and holding this wet finger over their right eye,"
Indicating "do you come in peace and to trade? ", Adam Jones (1983) notes that this was a standard sign along the Ivory Coast and at Cape Three Points, and lists several similar reports from 1663 to 1735. This is said to take place off the coast of Cameroon, however, Jones suggests that Ulsheimer may have confused his memories of the Ivory Coast with those of Cameroon. At Cape Verde, at the beginning of the coast of Guinea, Ulsheimer finds nothing of value to trade, except for ambergris. Of this, he is skeptical of its value, "a great swindle," and of its provinance, writing that it "is supposed to come from a whale." Ambergris was highly valued for use in perfumes and cooking, and is, indeed, a very rare product of from whales. This strongly suggests that the ambergris was procured by local fisherman regularly hunting whales off-shore. Born in Germany in 1578, Andreas Joshua Ulsheimer (or Ultzheimer) trained in as a surgeon, in which role (and barber) he travelled the world from 1596 to 1609, including a visit to West Africa in 1603-1604. A draft account of Ulsheimer's journal was rewritten by a clerk, under his supervision, and completed in 1616, but not published. Sections of a brother's copy, made in 1622, on America and Africa were published by Crecelius in 1878-1879. The original manuscript disappeared in 1945, however a photocopy held by Wilhelm Schneider of Tlibingen was used to prepare a translation of the comple work by Werg, published in 1971. 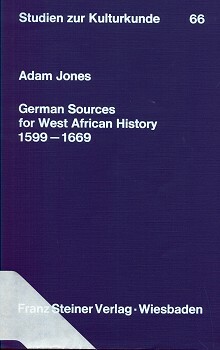 Considering Werg's edition as "not very reliable," this new translation of the African section by Adam Jones was prepared from the photocopy. "Ulsheimer's ethnographic observations on 'Guinea' (principally Cape Coast and Accra) and Benin complement the work of De Marees, who visited Africa a year earlier. De Marees's book deals mainly with the Gold Coast." "I have renumbered the chapters translated here, which are numbered 1, 2, 3, 4, 8 ,9 and 10 in the second part ofUlsheimer's manuscript." See Jones: Introduction, pages 19 and 20. [f. 33a] When we first arrived in the Rio de Camerones, the Blacks came towards us in 60 canoes (these are their ships), intending to attack us. We therefore prepared to defend ourselves, hanging canvas and sails around the sloop as bulwarks, and made ready the cannon. Before firing the cannon, however, we waited till they had come quite close, so that we could start firing with a good advantage. Upon this unusual and unexpected fire and thunder, they were so frightened that all of them plunged under the water in order to save themselves; but then they jumped into their canoes again and took to flight, for we shot many of them. The next day two canoes came. We could not understand what they meant by it. I 1732: 197; Atkins 1735: 73. One wonders whether Ulsheimer here confused his memories a of the Ivory Coast with those of Cameroon. [f. 45b] At Cabo [Cape] Verde, 140 north of the equator, the coast of Guinea begins. [Footnote] 35. Ambergris was used in perfumery and cookery. The trade in ambergris in the vicinity of Cape Verde was mentioned by Van den Broecke (1950: 8). Geoff Cater (2013) : Andreas Joshua Ulsheimer : Canoes and Whaling, West Africa, 1604.